The Grey Reef section of the North Platte River originates in central Wyoming near Alcova, about 25 miles southwest of Casper. Grey Reef is a 4-hour drive from Denver and 5 and a half hours from Salt Lake City. Casper is served by flights from major airlines in Denver and Salt Lake City. Although the most popular sections of Grey Reef exist on the upper 13 miles, there are actually 83 miles of highly productive trout water in the Grey Reef system. The upper section maintains good water quality through the brief spring runoff; the entire stretch fishes well during the rest of the year. Grey Reef fishes year-round, as it is ultra insulated from runoff by 5 reservoirs tightly spaced upstream. Grey Reef Dam was completed in 1961 and has performed its duty as an afterbay to Alcova Reservoir ever since. The North Platte River below Alcova Dam was subject to wild changes in daily flow due to electricity demands prior to Grey Reef Dam. Now, the flows are consistent and only increase or decrease with seasonal demand. The river intersects classic sagebrush prairie and is flanked by a variety of landscapes including rolling hills, mountains and cottonwood bottoms. The trout populations average 3,000 fish per mile, with 90 percent being rainbow and a mix of browns and Snake River cutthroat making up the remainder. Grey Reef is known for the large average size of its trout and the massive size of its trophy class fish. The average rainbow is 16 to 18 inches long, while trophy fish range from 25 to 30 inches. These fish can weigh from 6 to 15+ pounds. Nymphing is the primary mode of fishing during all seasons and water levels. A long leader of 9 to 12 feet and heavy weight (split-shot) can fish well during certain conditions, but a shorter, lighter 3- to 6-foot rig is great for targeting trout actively feeding on emergers. 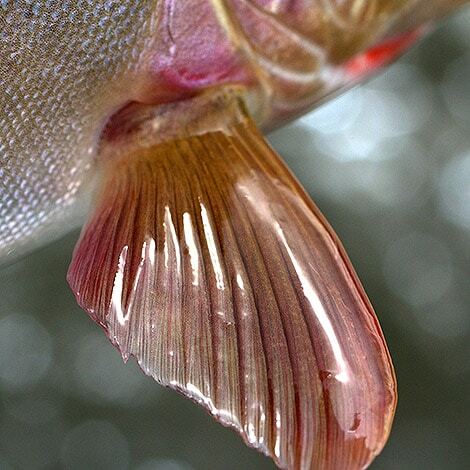 Three to 5X tippets are appropriate for nymphing, depending on what’s hatching and the water conditions. Streamers can be tethered to a sink-tip line with a 4-foot leader or a floating line with a 7- to 9-foot leader. Dry flies are best presented with 4 to 6X tippet and a long leader (at least 8 feet). Grey Reef trout typically like deeper mid-river troughs as this section has sparse bank structure, especially at lower flows. So a good move is to fish runs inside out— positioning your drift boat closer to the bank and fishing out toward the main channel, rather than fishing along the banks. The same is true for wading. The exception would be during high-water conditions, where increased depth allows trout to forage and seek refuge along the banks. Grey Reef is a year-round scud, midge, leech, worm and crawfish factory. During spring, expect to see good baetis hatches, which present great emerger-style nymphing dry-fly opportunities and even some effective streamer options. As the baetis hatch wanes in mid- to late May, the pale morning duns (PMDs), caddis and little yellow sallies make their appearance. Nymphing remains king during these hatches, but dry-fly fishing, can be excellent. Tricos start in mid- to late July and this is the begining of Grey Reef’s dry-fly season. With the appearance of tricos, Grey Reef’s trout will continue to look up through the psuedo, caddis and baetis(BWO) hatches… all the way through mid-October. Tricos will be a force nearly every morning until mid-October. Caddis are an important source of food through summer and fall, with nymphing primarily in the afternoon and dry-fly opportunities near dusk. Streamer fishing also gains steam during the summer as fry and crawfish become more available for foraging trout. Hopper fishing can be excellent in late July to mid-September, but this is not a predictable phenomenon. September welcomes temperate weather conditions and the forgotten pseudo hatch. Pseudos are normally an early afternoon event, and the trout will often move into shallow riffles to snack on the emergers. 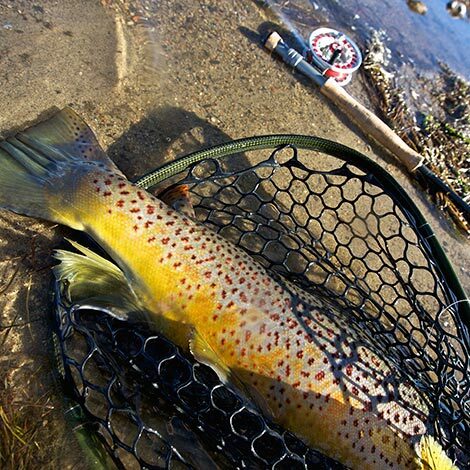 As the hatch progresses, trout will switch their focus to the top-water duns that remain on the surface until early evening. September to early October will usher in the fall baetis hatch, where both light nymph rigs and dry-fly setups are effective. Fall is also streamer time on Grey Reef. Targeting a trophy trout with a sink-tip and a short leader or a floating line and a longer leader can be highly productive. After the fall baetis have disappeared, prolific midge hatches offer great nymphing and dry-fly fishing through the winter, alongside solid streamer fishing. Nymphing leeches, scuds, worms and midges will be a staple until the spring baetis arrive. The Grey Reef section emerges below Grey Reef Dam. Grey Reef Reservoir is a small impoundment (or afterbay) located a short distance downstream of the much larger Alcova Reservoir. The afterbay’s job is to regulate the flow of water downstream and it also happened to create a world-class fly fishing destination. Grey Reef is a drift-boat paradise that’s easy to navigate. The shop has drift-boat rentals available for anglers who don’t own or want to haul their own rig to the Reef. A river shuttle service is also available through The Reef Fly Shop, and we will safely transfer your vehicle and trailer from the put-in to the take-out of your choice. In addition to float options, Grey Reef is a forgiving place to wade due to the relatively consistent depths of its sand, silt and cobble river bottom. While Grey Reef has plenty of public access, most of the river flows through private land. In Wyoming, the bottom of the river belongs to the landowner, as is the case in Colorado. In some states, like Montana, the land between the ordinary high-water mark is public domain; this is not so in Wyoming. Wading, anchoring, or even beaching your boat is considered trespassing here. 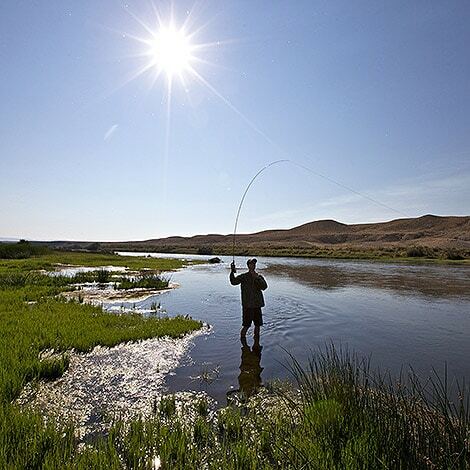 But, this fact keeps pressure low on most of Wyoming’s rivers and fly fishing productivity high. The North Platte River originates in northern Colorado just across the continental divide from major tributaries of the Colorado River system. It relies on snowpack from the mountains of the Routt National Forest in Colorado and the Snowy and Sierra Madre Ranges in the Medicine Bow National Forest of Wyoming. The river flows north out of Colorado toward Casper, where it turns to the east and eventually joins the Missouri River in Nebraska. 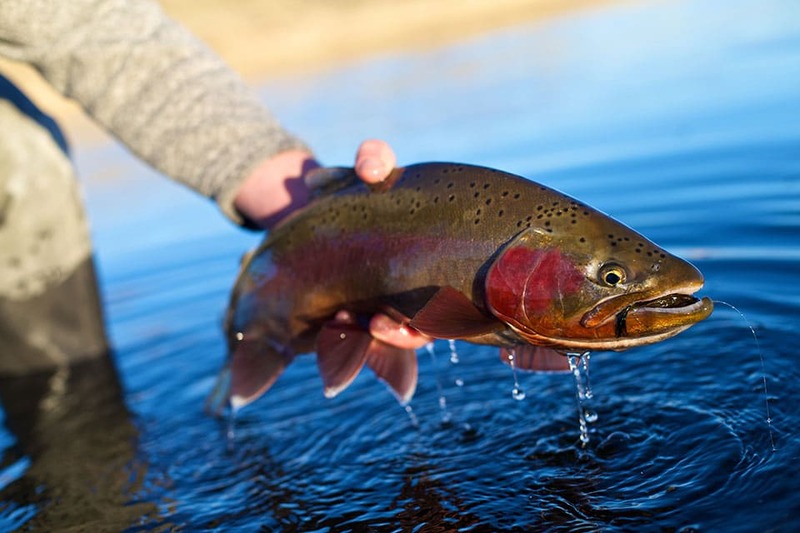 Grey Reef is historically not a trout environment, but the construction of several dams, most importantly Grey Reef Dam, gave rise to a spectacular coldwater fishery. The lower North Platte River was stocked with trout in the 1890s and Grey Reef was first stocked the spring following the 1961 completion of the dam. The lower sections are still stocked today. The upper 8 miles from Grey Reef Dam to the Lusby Access are considered a trophy fishery, where natural reproduction is the singular source of trout recruitment. It’s a also worth noting that Wyoming Game and Fish Department along with the Bureau of Reclamation have instituted a flushing flow program for Grey Reef. For 10 days each spring (and sometimes in the fall) the flows from the dam are dramatically increased and systematically decreased to purge the spawning gravel of silt that might otherwise inhibit survival of trout eggs. Since 1996, the program has helped boost natural reproduction throughout the Grey Reef stretch. Visit Grey Reef with the expectation of nymph fishing for the highest productivity and be prepared when dry-fly and streamer opportunities arise. Fishing pressure is comparatively low and at times you may not see another boat during your day. There are several campgrounds and lodging facilities in the vicinity although dining options are limited. It is close to Casper—Wyoming’s second largest city—that has all the services you might need. Grey Reef is easily accessible, it’s easy to navigate and it’s a consistent, reliable fishery with a strong potential to produce your biggest brown or ’bow.